Two drug dealers who lured an associate to a woodland and carried out a "carefully planned and brutal murder for gain" have been jailed for life. Sam Mechelewski, 20, was killed in a Cambridgeshire country park on 31 January after being stabbed through the neck and beaten with a baseball bat. Jordan Shepherd, 24, and Ashley White, 21, murdered him to steal £2,000 and drugs to gain "respect", a judge said. White was jailed for a minimum of 29 years and Shepherd for 28-and-a-half. 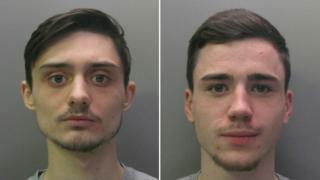 Shepherd, of Mayfly Close, Chatteris, and White from West End, Brampton, both denied murder but were convicted by a jury after a six-week trial at Cambridge Crown Court. Mr Justice Julian Goose QC told the court Mr Mechelewski had been a street dealer earning about £1,000 per week, which was "considerably more" than fellow dealer White. Mr Mechelewski had been living with Shepherd, whom the court was told had been dealing in conjunction with the victim and had been earning up to £150,000 a year from his operation. But Mr Justice Goose said that after Mr Mechelewski had been robbed and assaulted, Shepherd saw he "couldn't be relied on any more". He added the killing cleared the way for White to take the drugs trade in Cambridge and work closer to Shepherd. The pair donned dark clothing and ensured all three of the men had their phones switched off to avoid detection when they went to Hinchingbrooke Country Park, Huntingdon, on the evening of 31 January. They had lured Mr Mechelewski there on the premise of finding a cannabis farm but struck repeated blows over the head with a bat and stabbed him twice in the neck. Mr Justice Goose said the killing was to "make a clear statement and gain fear and respect from those in the drugs world". Both men claimed the other had attacked Mr Mechelewski. Shepherd claimed the victim was like his "little brother" and denied wanting to steal his contacts or supplies. Meanwhile, White told the court he had run away in fear after seeing Shepherd "punch" Mr Mechelewski. Last week, Shepherd's ex-girlfriend Ciara Ratcliff, 22, of Sycamore Drive, Huntingdon, was cleared of a separate charge of perverting the course of justice. She was accused of giving a false alibi for her then boyfriend and lying to police about when she last saw Mr Mechelewski.